How to maximize revenue on the menu "PREMIUM PICK"
As on the previous page I promise that here I will explain how to maximize revenue through the menu "Premium Pick" After download and register whaff, then at the beginning of the screen there is a menu of Premium Picks, Premium Picks will provide 3 types of reward money at once to be gained from Install Reward, Daily Play and Daily Rewards. For users unfamiliar with no definite whaff whose name Premium Picks. But for a new user who just run Whaff probably tips 3 How to get money from the premium picks on Whaff this will be helpful to collect more dollars to be withdrawn immediately and disbursed to each local bank when the "earning" it reached a point of minimum payout 10 $. Explanation of the menu "PREMIUM PICK"
the Mission of the daily as the Daily Play. 3. Daily Reward "Do not uninstall and get $0.01 a day"
Daily Reward is the Commission obtained when application is installed are not removed from your Android device. 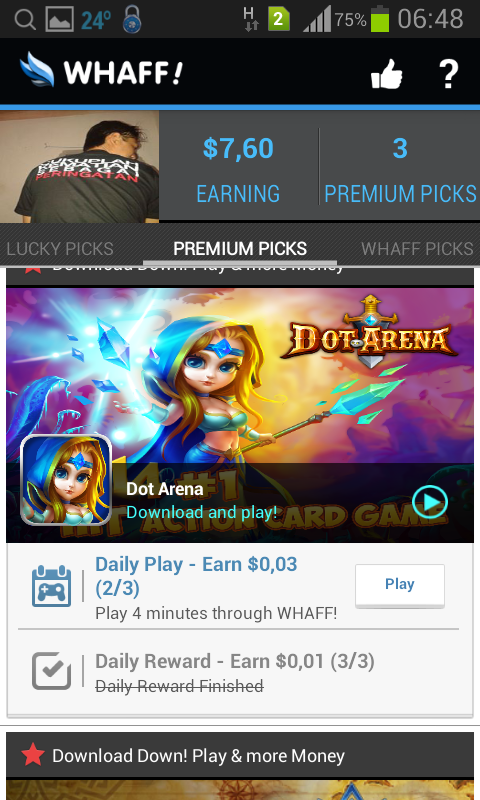 This application will give the Commission every day is usually $ 0.01 until at a certain period of time.That's tips on how to earn money from the Premium Picks on Whaff. If the mission daily on one application in Whaff Picks have been resolved, usually in a couple of days later there will be an extra mission again. 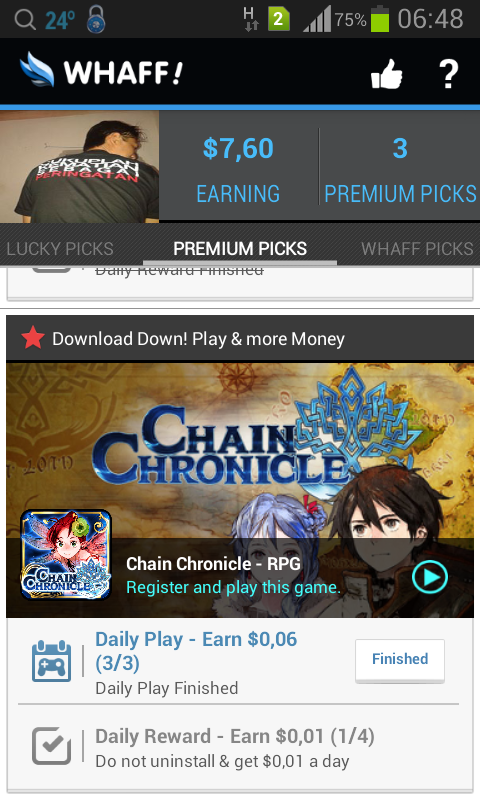 If you remove the application and then install it again whaff won't give you commissions from installing applications on your account unless You Whaff application is still in the menu "premiumPick" up and running you can still be the Commission of "play" and "Daily Daily Rewards"
Opps...!! Just a suggestion , if the application you downloaded earlier is still in the " PREMIUM PICK " should not be uninstalled or removed from your android , because they are still willing to pay if run for 4 minutes for $ 03 up to $ 0.6 and $ 0.1 if they were on your android . .
On the next page I will explain how to take MONEY from "WHAFF Rewards" sign in to your PAYPALL account. OK friends, I think it's pretty obvious.If you do not understand please feel free to ask in the comments I will try to help you. IF YOU DON'T HAVE AN ACCOUNT? HERE ~~>> HOW TO REGISTER "WHAFF REWARDS"
0 Response to "How to maximize revenue on the menu PREMIUM PICK"